Are more College of Marin students transferring to four-year institutions in less time? To find out, Planning, Research, and Institutional Effectiveness (PRIE) used data from the National Student Clearinghouse to track College of Marin (COM) first-time freshman cohorts starting from the 2009-10 academic year. The analysis included students who completed at least 12 units at COM, then transferred to a four-year institution. 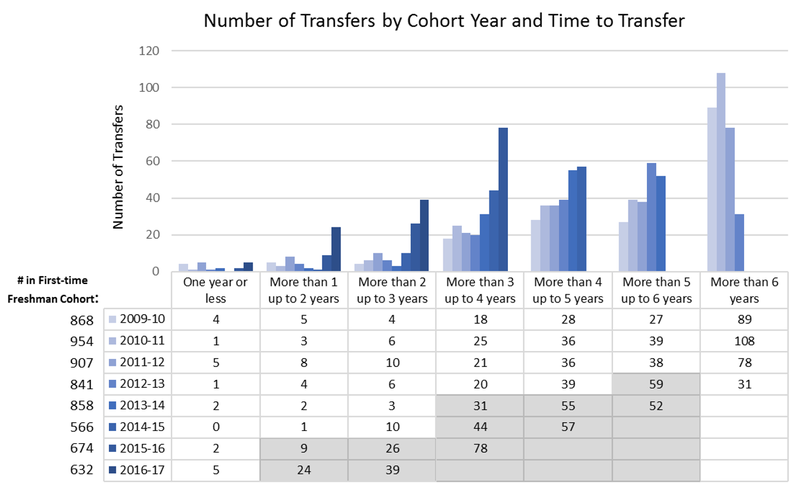 The chart below shows the number of COM students transferring by freshman cohort and the number of years it took them to transfer. Starting with the 2013-14 cohort, there is an increase in the number of students transferring in five to six years. In subsequent cohorts, this pattern is expanding—more students are transferring in fewer years. You can see this pattern in the bar graphs and the specific numbers in the gray area below.